We’re getting one more tournament in before the end of the year to benefit yet another great charity, and this one features some great extras, including the opportunity to win a brand new pinball machine. Register at 11 a.m., tournament play 12-4 p.m.
Why: All A Division entry fees and half of B Division entry fees benefit Mike Ditka’s Gridiron Greats Assistance Fund, which provides financial grants and ‘pro bono’ medical assistance to retired NFL players in dire need. Less than 24 players, 4 players will go to playoffs. 24 – 31 players, 6 players go to playoffs with top 2 getting a bye. 32+ players, 8 players go to playoffs with no byes. Playoffs will be 3 games with 4, 2, 1, 0 scoring. 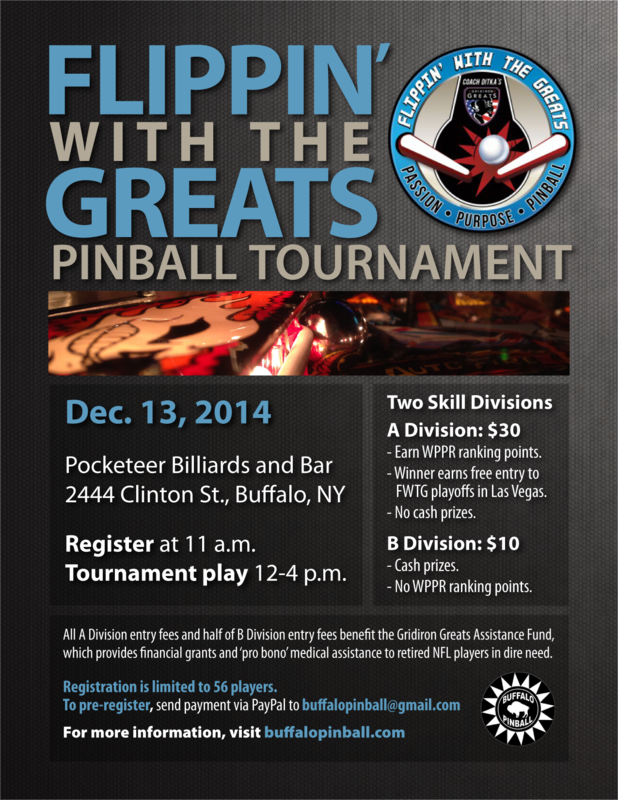 Winner earns a free entry to represent the Buffalo Bills at the Flippin’ with the Greats Grand Final Playoffs, March 27-29, 2015, at the Pinball Hall of Fame in Las Vegas. The winner of the Grand Final Playoffs will receive a brand new pinball machine (more details here). No cash prizes — but! First place wins an entry into the IFPA LAS VEGAS FWTG final event for a chance to win a NEW pinball machine and a set of 3 Gridiron Greats Hall of Fame medallions with low, matching serial numbers and Certificate of Authenticity signed by all 3 players. Second place wins a set of 6 PAINTED Gridiron Greats NFL Star Medallions with matching serial numbers, featuring 2 color epoxy paint fill matching the players team colors. 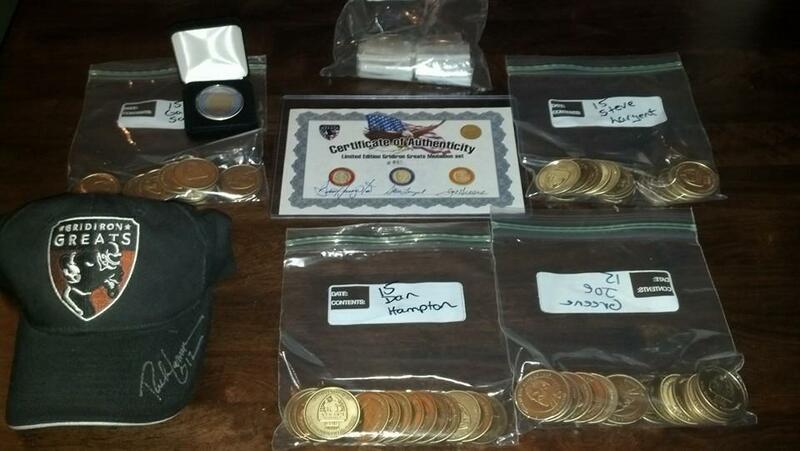 Third/fourth place: prizes will be an Antique Bronze set of 6 Gridiron Greats NFL Star Medallions with matching serial numbers and/or a Gridiron Greats hat signed by 2002 NFL MVP Rich Gannon. You can give 3rd place choice with remaining prize to 4th place. Prizes for A division. Each registered player in the A division will receive a medallion! For new or casual players. No WPPR ranking points awarded. Registration is limited to 56 players. Pre-register today to ensure your spot in the tournament by sending payment via PayPal to buffalopinball@gmail.com. Please note that no refunds will be given after Dec. 6. No registrations will be allowed after 12 p.m. on the day of the tournament.